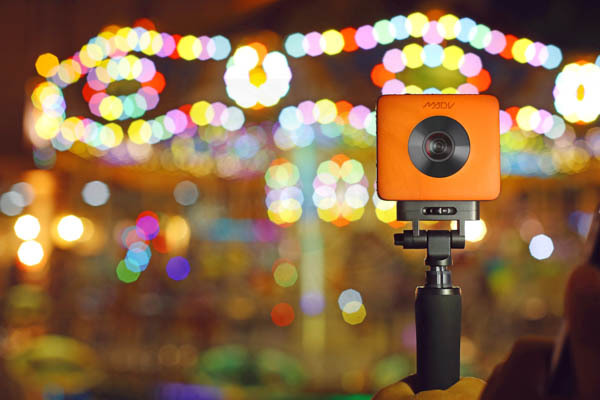 Home » 360 Camera News » What’s the difference between the Mi Sphere and MadVenture 360 Camera? 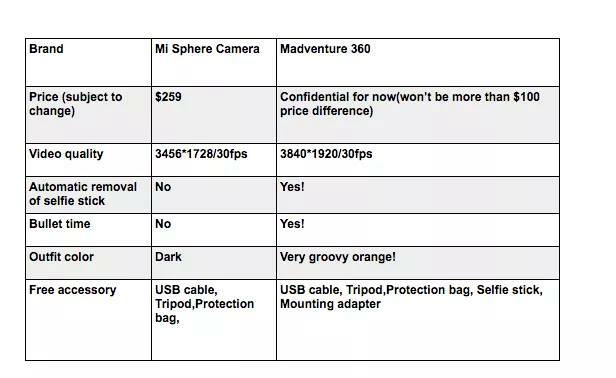 What’s the difference between the Mi Sphere and MadVenture 360 Camera? 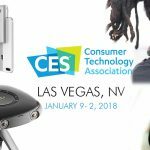 The makers of the very popular Mijia Mi Sphere camera have just announced a new camera called the MadVenture 360. 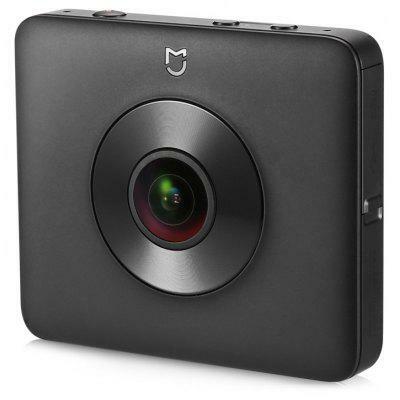 This new 360 camera comes less than 6 months after the release of the Mi Sphere and it has had a lot of people wondering if their Mi Sphere’s are already obsolete. The MadVenture looks suspiciously similar to the Mi Sphere, apart from the bright orange cover, so what is the difference between them. The answer is nothing. They are the same camera. The reported upgrades in video resolution will be down to new software, which apparently will also be coming to the Mi Sphere. Internally both cameras use the same processor and optics, the only physical difference is the bright orange cover. So why would Xiaomi release an almost identical camera under a different name? 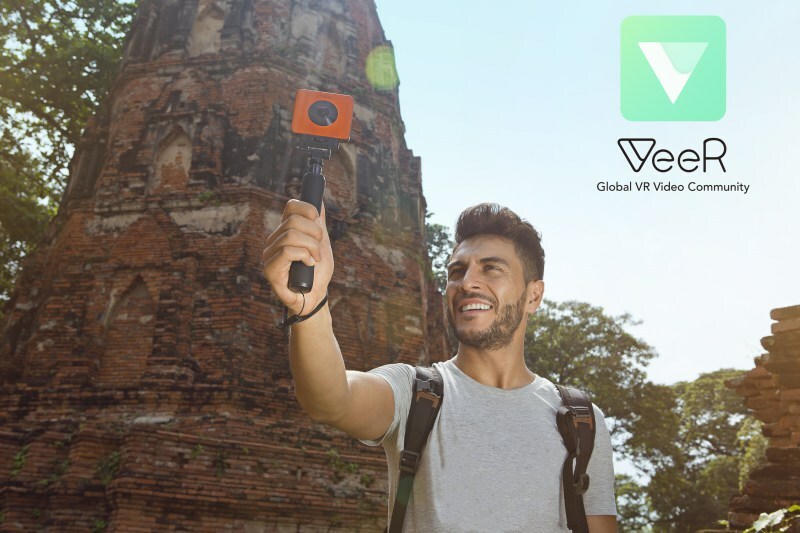 It seems to me that they want to market the new device to the action camera market, and it’s easier to do that with a new camera that looks a bit different. The marketing material seems to back this up. with photos of people surfing with the camera. Here is a table showing the difference between the two cameras as of now. However after some people expressed dismay that they just bought a Mi Sphere, representatives from Xiaomi were quick to reassure people that the Mi Sphere will be receiving an update that will bring the upgrades. What this means is that current owners of the Mijia Mi Sphere can look forward to a software update that will enable the camera to shoot at 4K resolution. Currently, the Mi Sphere is a great camera for 360 photos, but the video resolution is a bit low at 3.5K, an upgrade to 4K would bring it in line with most modern 360 cameras. The Mi Sphere is my recommended 360 camera. Soon to be updated with 4K video. The MadVenture will also come with an “invisible selfie stick” and GoPro mounting adaptor. One new feature that the MadVenture may have that the Mi Sphere doesn’t is water resistance. 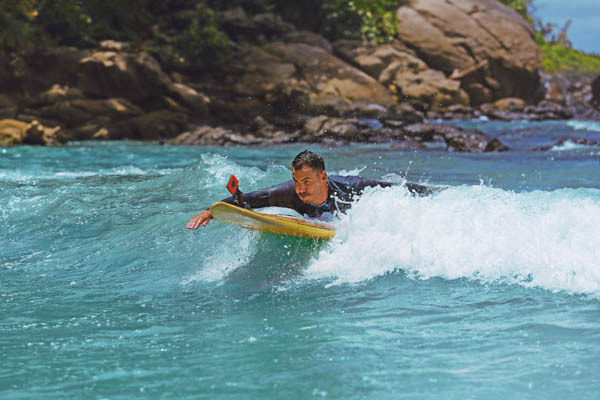 In one marketing image we see the orange MadVenture attached to a surfboard. You would’t want to do that with your Mi Sphere, because going underwater would likely kill it. It could be that the bright orange outer shell makes the camera waterproof to some degree, which would give it an edge as an action camera. On my epic 360 camera comparison table, I recommended the Mi Sphere as the best all-round 360 camera, even before this latest upgrade. Now it’s by far and away the best value 360 camera available. Sure, there are other cameras with more features and better quality video, but you get a lot of bang for your buck with the Mi Sphere. Thanks for the great article. THIS has been my main challenge in deciding which to buy. I certainly like a discreet camera, and I already own a Rylo for action shots, so the Mi Sphere is a great option. I can always buy another later if needed. So many choices. Thanks! Hi ive been looking at the mi sphere v madventure correct me if im wrong but have they not both got the same water resistence of ip67 ? ?